We decided to take to the skies with the first issue of 2014 – which also marks the beginning of our second year of publication! We’re featuring four aerospace companies – Sierra Nevada Corp., Virgin Galactic, Reaction Engines and XCOR Aerospace – all working hard to launch a new generation of winged spacecraft to outer space. We’ve also got an extensive article featuring beautiful photos of the Earth’s Auroras. 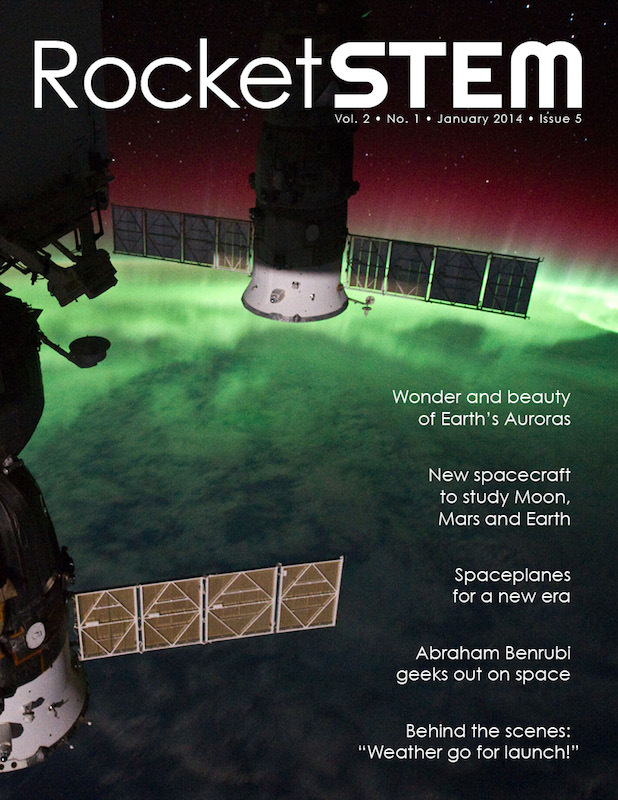 Our latest issue also goes international with updates on space missions from India, China and Europe, as well as the United States. India and America are heading to Mars, while China has arrived at the Moon, and the ESA is investigating both the Earth and the Universe itself. Actor Abraham Benrubi shares his love of space and science fiction with us. We journey behind the scenes of the 45th Weather Squadron at CCAFS in Florida, and even take a final look at the journey of Comet ISON. All this and more in latest edition of our non-profit publication. Nothing but success for China with the descent of its lander and deployment of a rover. Before a rocket is cleared to launch, many must weigh in, including meteorologists. Venture close enough to the poles and you can witness a visual display like no other. Four companies are working to develop a new generation of winged spacecraft. He’s a character actor, voice of Darth Vader, and an avid space geek.